If you have been caught up in the terrible attack in Manchester on 22 May 2017 you may feel frightened, upset or angry. Even if you haven’t been directly affected, events like this can have a major impact on how you feel. Everybody reacts differently and whatever you are feeling is completely normal, there is no right or wrong way to react. Specialist support for children and young people in Lancashire is available through our Nest Lancashire service. Through Nest young people can access support in person, by email or via text message. The Nest worker will work with the young person to find the right type of support for them and to help them move forward. 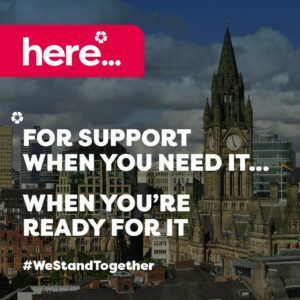 If your child has been affected by the events in Manchester the best way to support them is to give them the opportunity to talk about what happened. This guidance from the BBC can help you talk to your child about what has happened. If you have been affected we are here to support you. We provide emotional support and practical help to make sure you can move forward. We will work with you to find the best way forward together. Whether you simply need someone to talk to or need practical help in dealing with the impact of what has happened, we are here to support you. Contact us on 0300 323 0085, email info@lancashirevictimservices.org or use our contact us form. It is completely normal to feel emotional and distressed following a terrorist attack. Events like the one in Manchester can trigger a range of emotional responses which can include feeling sad, angry, anxious or distressed. These responses are a normal part of recovery and are the mind’s mechanisms of trying to make sense and come to terms with what has happened. They should subside over time. If you are concerned you can speak to your GP to access mental health support. The NHS has also released this mental health wellbeing advice which you may find useful.